Sr. Anita Cleary and I, along with two colleagues, Kathryn Raistrick and Julie Wullner, have been working in El Paso since last Tuesday and have our last day tomorrow. 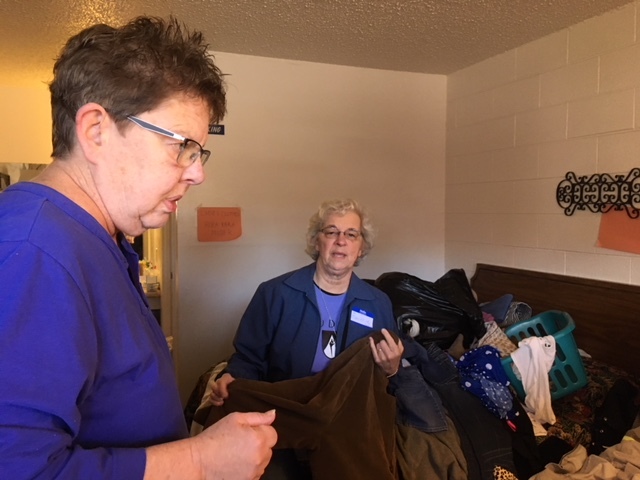 As I read Patricia Erickson’s account, I recognized similarities – folks arrive in the afternoons when released from the detention center to the care of Annunciation House, are welcomed and briefly oriented (noting that we are church group and not government), interviewed, given clean clothes, a room and a meal. The interview gives information about the family/sponsor person who will purchase bus or plane tickets for the asylee to travel. Annunciation House recently rented rooms in two side by side motels to provide sufficient housing with the recent decision of ICE to release asylees– one being all inside with a continental breakfast and the other with outside room entrances. A tent on the parking lot provides space for the meals – breakfast for one group (Julie coordinates this) and lunch and supper for all. Thankfully there are heaters, as the mornings started out in the 20’s and 30’s. One room serves as an office, another as clothing and hygiene storage, and a third for food. Volunteers bring dinner and supper meals; some stay to serve and some don’t. However, people are incredibly generous. Clothes arrive almost every day and need to be sorted to be ready for families arriving from detention. And then sorted again the next day. My first two days were sorting and sizing clothes. When Kathryn and I first stepped into the room, we couldn’t. The bed, chairs, and floor were covered. As well as speaking more Spanish than I do, Sr. Anita also has nursing training. So sick children and a pregnant mom have needed her attention. We four work the 7-2 shift. Arriving, we check in with the overnight person, prepare for breakfast, look at the board to see what calls need to be made, look at another board to plan for departures. Bus? Plane? Can the shuttle take all 15 to the Greyhound station? Who can make an airport run? I’ve done airport runs the last two days as well as a few bus station trips. Airports are the most challenging. On Saturday, after the volunteer site coordinators at each motel left to go back home, we split to provide some coverage at both places. I was delighted two volunteers arrived from Colorado the night before and one was a fluent enough Spanish speaker who could cover the phones as we tried to contact families/sponsors who were buying bus or plane tickets for our guests. That day we had 19 persons to get to the airport and 14 to the bus. I was ready to leave for the airport this morning and realized that the airlines confirmation number of 12 digits wasn’t it. It took multiple phone calls to secure the correct confirmation information which was relayed to us as we headed to the airport anyway. I’ve learned to get the cell phone number of key volunteers to keep in touch as we work. Some days we have 30 new folks, other days 70 or 80. I’m not sure how many are here on any given day. Some need to stay only a day, others 2, 3, 4, 5. Friday, I had to tell a woman that she wasn’t leaving that day; rather her departure would be Sunday. Her face fell, and tears came. I could only put my arm around her. When she later came to the office, I learned more of her concern. She would arrive at her destination on the 20th and needed to report to immigration on the 21st. She was petrified on not being able to keep that appointment. People’s appreciation for all that is given them is palpable. “Rico”, said a smiling pre-teen boy as I re-filled his glass with cold water. So grateful for that cup of water. Sister Marcelline’s article was excerpted in Global Sisters Report (GSR). To read the GSR article, “Sisters report on plight of asylum-seekers amid caravan headlines,” please click here.